The placental regions of importance in normal pregnancies and those associated with complications. 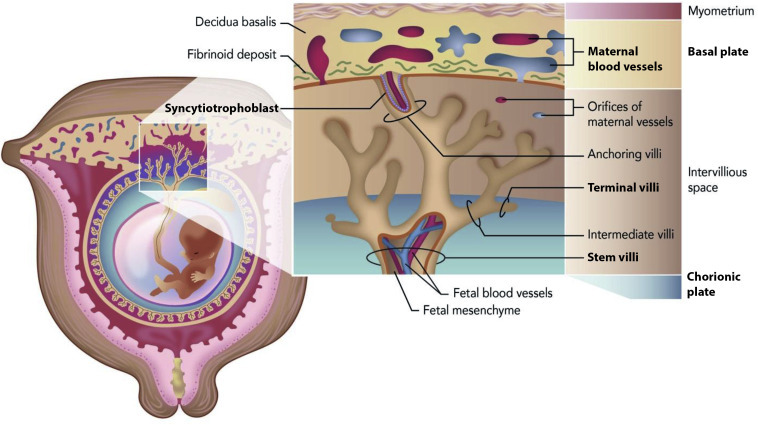 The maternal blood vessels, basal plate, terminal villi, stem villi, chorionic plate, and syncytiotrophoblast regions are all bolded in this figure to illustrate their importance in pregnancy complications. The phrase, "the miracle of life" seems apt when one considers everything that has to go right during conception and pregnancy. Three discrete biological events (embryo implantation, decidualization, and placentation) are necessary for a successful pregnancy. A disruption in any of these complex events can cause complications that researchers believe could be treated if we fully understood-at the molecular level-how pregnancy related problems develop. Deep placentation, for example, is one of the primary pregnancy transformations that can lead to problems, even after successful implantation of the blastocyst (a trophoblast and an inner cell mass). Deep placentation is when the trophoblast invades the placental bed, disrupting the cells and vessels necessary for normal development. In previous studies, researchers used nuclear magnetic resonance spectroscopy (NMR) and mass spectrometry (MS) combined with liquid chromatography (LC) to identify metabolites and lipids associated with complications in the placenta. Considered conventional tools, they did capture changes in metabolites and lipids in maternal fluids and more clearly identified molecular structures. However, the tools demonstrated low sensitivity and other limitations, which means it is likely there is more detailed information we can-but haven't yet-discovered. The future, PNNL researchers argue, is in ion mobility spectrometry coupled with mass spectrometry (IMS-MS) and nanospray desorption electrospray ionization mass spectrometry imaging (nanoDESI MSI). NanoDESI MSI shows promise in improved molecular spatial localization and IMS-MS provides greater coverage of metabolites and lipids, allowing researchers to pinpoint not just what we should be looking for in the uterus, but where in the uterus we should be looking for clues to possible pregnancy complications. For example, researchers could incorporate IMS into the LC-MS-based metabolomics workflow, giving us three-dimensional analyses that break down the molecular formulas for different chemistries that play important roles in biological systems. And, the researchers say, such molecular findings will enable development of clinical tests for rapid diagnosis and treatment of pregnancy-related conditions. This work was supported by PNNL’s Laboratory Directed Research and Development program and is a contribution of the Microbiomes in Transition Initiative, as well as the National Institutes of Health (NIH) National Institute of Environmental Health Sciences and the NIH Eunice Kennedy Shriver National Institute of Child Health and Human Development grant.